Count on Duluth Cargo Connect for seamless cargo handling, storage, distribution and transportation logistics services for breakbulk, heavy lift and other project cargoes moving in and out of North America’s heartland. 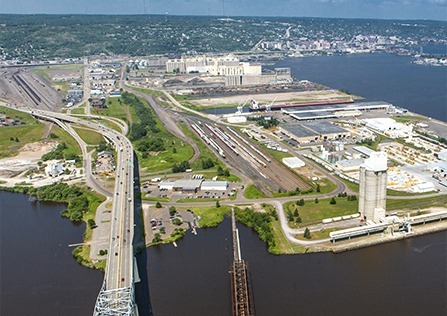 Duluth Cargo Connect is a working partnership of Duluth Seaway Port Authority and Lake Superior Warehousing. Take advantage of all the perks of our Foreign Trade Zone status, including duty-free storage and staging. Connect to the Great Lakes St. Lawrence Seaway System and a fast, flexible freight network that extends across the U.S. and Canada. Benefit from our expertise and the robust facilities to handle your heavy-lift and dimensional cargo needs.